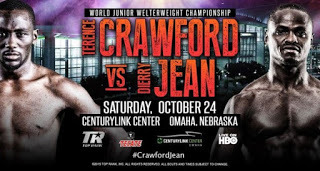 Terence Crawford (27-0) fought Dierry Jean(29-2) for the WBO Junior-Welterweight Championship of the World in Omaha on Saturday night. The fight was really a casting call for the challenger to meet Manny Pacquiao in his last performance, now scheduled for April 9, 2016. Crawford was the favorite in the 12 round bout and produced a TKO in the 10th round -- which insured his getting the role. A good deal was a stake since the April 9th fight will be a big pay day and Crawford fought like that, switching to a southpaw stance early on. His jab was now a power punch and every time Jean threw one of his own he caught Crawford's right hook. Crawford is a lethal combination of boxer and fighter which is to say he's a defensive counterpuncher who likes to remain right on top of his man. Boxing is a metaphor for the food chain of human life and the fight arenas for these high level gladiatorial events, dotted as they always are with winners and losers, constitute part of the drama. Warren Buffett aka "the sage of Omaha" was in the audience. As you might expect for a man who flaunts his modesty, he was not in a ringside seat -- though he did wave to the HBO cameras. The Haitian-born Jean himself has been a sparring partner for Pacquiao and he had a lot of heart in the face of Crawford's onslaught. But the referee Tony Weeks spared him from his own willpower and from an even worse beating then he was already taking by calling the fight when he did. Yet in one fell swoop he had lost his big chance. In actuality there isn't as much room at the top in boxing as life. If boxing is a metaphor for life, it's a hyperbolic one. The Anthony Quinn character in Requiem for a Heavyweight is nicknamed "Mountain" not only because of his size but due to the heights from which he would eventually fall.